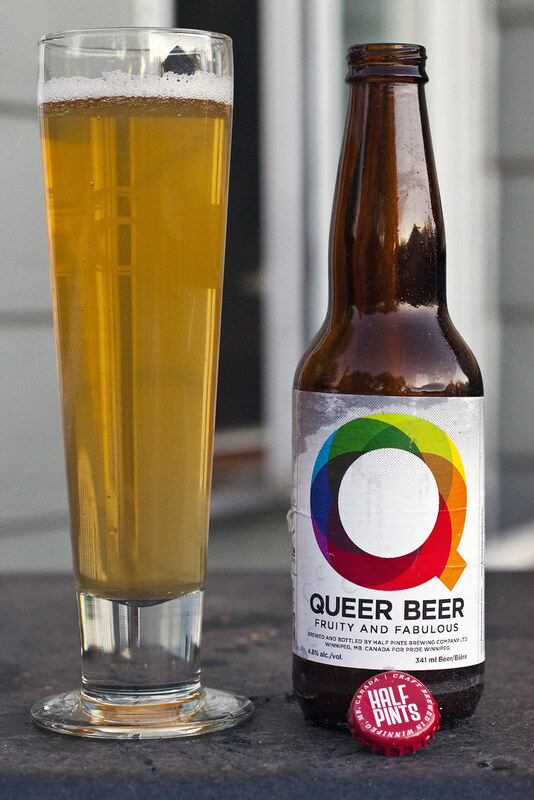 For Winnipeg Pride Festival, Half Pints brews a special beer JUST for the event called Queer Beer, and generally, it sells out near immediately at the brewery, and if available at any liquor marts - there too. I got to try Queer beer last year, and it was a beer based off of St James Pale Ale with an addition of organic raspberries, but this year - it's an incredibly different beer, this time, it's a Helles lager. Appearance: Light blonde, slightly hazy like an incredibly light hefeweizen. There's minimal white head and a bit of carbonation going on. Aroma: Slightly malty and a bit of a lemon citrus aroma. It's almost like a St James as it is a bit similar to a light pale ale, bit lagery but not bad. Doesn't have that standard corny/ricey aroma that we're used to for most lagers.. thankfully. Taste: Tastes like a St James but with more hops, a lemon citrus. Quite well balanced, quite a bit like a lager but since it lacks that "bleh" taste we're used to in standard macro lagers.. this is quite drinkable. Leaves a bit of a slight acidic aftertaste. Overall Thoughts: Personally, I preferred the 2011 edition of Half Pints' Queer Beer with a nice raspberry freshness to it. It was refreshing, sweet and good for a hot day. This year wasn't bad but I certainly preferred last year's more than this year's. The lemon citrus taste mixed with a well balanced pale lager makes it much more enjoyable than the standard Molbatts. I wouldn't go out of my way to drink this (which I didn't), but if came into my presence again, I'd sure drink it.